Ad features mods and Blitz-era Brits, but Mr Blobby is denied a return to TV. Tesco is today launching a TV ad, by Bartle Bogle Hegarty London, as part of its 100th-anniversary celebrations featuring a slew of cultural references from across the century. Starring the roller-disco girl who featured in this week’s press ads, the film whizzes through a supermarket featuring mods on mopeds, an Apollo astronaut, wartime shoppers and a hippie wagon parked outside. It is supported by press and outdoor executions, one of which features "TV icon" Mr Blobby – although there is no space for him in the TV ad – and another stars Wolf from Gladiators. The campaign, which flags up current price savings, will also include radio, digital and social activity. The work was created by Psembi Kinstan and Hannah Tarpey. The production company was Riff Raff. Media was handled by MediaCom. 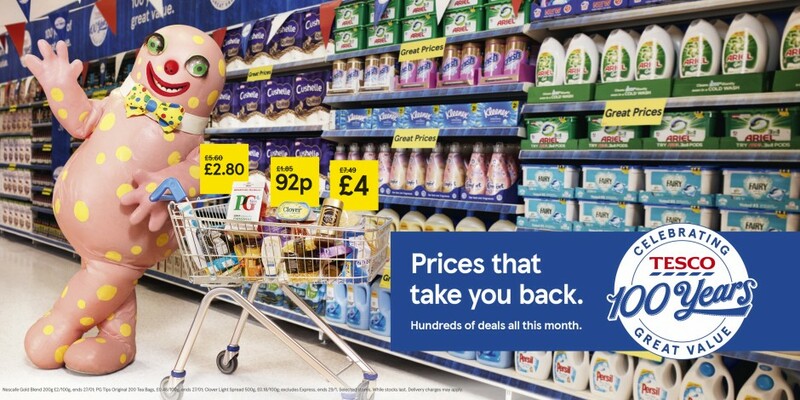 Alessandra Bellini, chief customer officer at Tesco, said: "Our customers tell us that they feel the pinch after Christmas and we want to help by offering some great prices on popular products. So to celebrate our 100th anniversary, we’ve created the centenary advertising campaign, which uses iconic cultural moments from the last 100 years to evoke nostalgia for our customers while also having a great price tag to match."